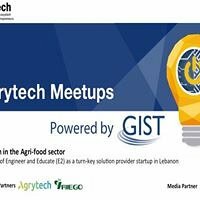 Join our next Berytech Meetup, powered by GIST (the Global Innovation of Science & Technology network) & be part of our growing community. Access resources, connections, and support that will help you grow your potential & thrive in the entrepreneurial ecosystem. Our upcoming Meetup will take place on Wednesday, January 18, 2017 at Berytech Mathaf, 3rd floor from 6:00 till 7:30 PM and focuses on Innovations in the Agri-Food Sector. Expert Talk by Elie Shammas, Co-Founder of Engineer and Educate (E2): "Need and talent are not enough for a startup! The journey of Engineer and Educate (E2) as a turn-key robotics system solution provider startup in Lebanon." Guest Entrepreneur Talk by Antoine Skayem, Founder of RIEGO, a solar powered, agricultural irrigation dynamic- control devise that enables optimizing irrigation water consumption. Antoine will expose his startup, discuss the challenges, and provide insightful business tips. Ecosystem partner Talk by Ramy Boujawdeh, GM of Berytech, discussing the Agrytech Program and its many opportunities including the open call to apply to the Agrytech Accelerator program with up to 40k in grants and one year of incubation. Network, Learn, Get Support, Meet like-minded people, Win Prizes and enjoy the fun! GIST, initiated by the U.S. Department of State, aims at building a strong & vibrant network of entrepreneurs in Lebanon focusing on science & technology. Learn more here. Elie Shammas graduated from the American University of Beirut with a B.E. degree from the Mechanical Engineering Department in 1999. For his M.Sc at Carnegie Mellon University he designed and built a snake robot, then he acquired a Ph.D from the Mechanical Engineering Department at Carnegie Mellon University in March 2006. From 2007 till 2010, Elie worked as a research and development engineer at Hexagon Metrology where he developed kinematic calibration algorithms for high accuracy portable Coordinate Measuring Machines. Since 2010, Elie has been an Assistant Professor in the Mechanical Engineering Department at the American University of Beirut. Elie's research expertise span multiple disciplines such as robotic joint and mobile robotic platform design, nonholonomic motion planning, and calibration and kinematics of robotic manipulators. As an entrepreneur, Elie has co-founded a system-integration company, Engineer and Educate (E2), which is incubated at the American University of Beirut. E2's mission is to provide turn-key robotic systems solutions for the local industry, especially the ago-business sector. Since 2015, Elie also severed as a mentor on the TV show Stars of Science, where he helps young Arab entrepreneurs realized their inventions and build working prototypes. Antoine Skayem, an entrepreneur specialized in renewable energy and sustainable solutions. He founded the first start-up in 2013, Free Renewable Electric Energy, FREE SAL, a company specialized in renewable energy and energy efficiency solution. In 2016, he co-founded RIEGO, a smart irrigation controller that reduces the water consumption in agriculture. He is passionate and driven by constantly creating value and impact on his community and the environment. Antoine has been involved in projects related to sustainable agriculture and, lately, solid waste management. He is also co-founder in Shift Lebanon (www.shiftlebanon.org), a NGO that aims at decentralizing the start-up ecosystem outside Beirut; in addition to empowering the youth living in the suburbs and rural areas. He holds a Master in Industrial Engineering and Management.